As I sat by the window of a popular coffee shop in downtown Charlottetown on a warm afternoon in September 2014, two student actors from the University of Prince Edward Island (UPEI) appeared on the street corner opposite, heading toward nearby Province House, seat of the provincial legislature. He wore a three-piece suit and top hat; she sported a shirtwaist, hoop skirt, elaborate hat, and shawl. This is a common sight near Province House during the summer tourist season,[i] but it struck me as noteworthy because I happened to be brainstorming thoughts for a post on Prince Edward Island (PEI) and the First World War centenary. The sight of 1860s-style citizens promenading down the street in 2014 reminded me that all commemoration takes place in a crowded landscape of competing commemorations, even when the subject is as globally game-changing as the First World War. PEI, Canada’s smallest province, has been celebrating 2014 in grand style all year long, but not because of anything to do with the First World War centenary. 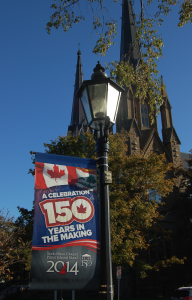 Instead, the island is celebrating the 150th anniversary of the 1864 Charlottetown Conference, when the then-colony of PEI hosted the first serious discussions of a confederation of British North American colonies – a union that eventually became the Dominion of Canada. This tourism-reliant province long ago branded itself the “Cradle of Confederation” (even though it might be more appropriately – if less elegantly – described as the “Conception-place” of Confederation), and the 1864 sesquicentennial has offered a convenient excuse to throw a huge summer-long party involving countless commemorative events and commissioned works of art, theatre and music, in communities of all sizes from tip to tip of the island. From souvenir top hats and Confederation-themed stationery, to 1864-inspired comedy and a massive Shania Twain concert, the “PEI 2014” celebrations have pumped provincial money into the local economy and squeezed every ounce of promotional juice from PEI’s shining moment on the Canadian national stage. 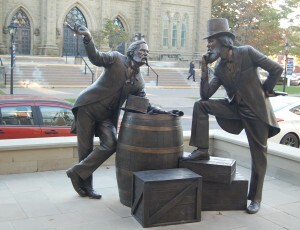 Along the way, initiatives like new public art and interactive “Which Father of Confederation Are You?” quizzes have helped turn a “great men of history” narrative into something a little more accessible and engaging to ordinary citizens. Here on Prince Edward Island, the centenary of the First World War – a conflict English-speaking Canadians have often been told forged them into a “true” nation – has had to take a quiet backseat to a different narrative of nation-building. This is not to say that the war’s centenary has gone unnoticed on the island. Back in May, the Prince of Wales and Duchess of Cornwall paid a brief royal visit in May, officially promoted as marking both the First World War centenary and the Charlottetown Conference sesquicentennial. Around the same time, two attractive new planters with “We Will Remember Them” nameplates dedicated to the soldiers of the First World War appeared on either side of the provincial war memorial, a gift from the grade 7 students of Birchwood Intermediate School. [ii] In June, the 11th biennial international conference of the L.M. Montgomery Institute took as its theme “L.M. Montgomery and War.” The Guardian, Charlottetown’s newspaper and the province’s long-time paper of record, marked the centenary on 4 August with two articles, one detailing Islanders’ contributions to the war effort, and the other a thoughtful analysis of the coming of the war as reflected in the pages of the 1914 Guardian by UPEI librarian Simon Lloyd. Gwynne Dyer’s book tour brought him to the island in September to speak about what Canada learned from the Great War, and the PEI History of Medicine Society’s October gathering featured scholars discussing the legacy of martyred British nurse Edith Cavell and new insights into shell-shock. Doubtless similar events will unfold over the coming months and years. But on the commemorative battlefield of PEI in 2014, 1864 has unquestionably bested 1914. While most First World War centenary commemorations around the world will likely include some form of honouring the past (remembering the war’s terrible cost in lives lost or forever altered), it is much harder to celebrate the present in a global sense when it includes the Russia-Ukraine conflict, the Syrian Civil War, ISIS aggression in the Middle East, and a frightening Ebola Virus epidemic in West Africa. Knowing that the “war to end all wars” was followed by a Second World War, a Cold War, and the ongoing fallout of the 9/11 terrorist attacks similarly hinder our ability to celebrate the present. It is equally difficult to plan a bold future in the context of accelerating environmental degradation and no sign of political extremism abating anytime soon. Nearly a century later, we are still waiting for the better world we were promised at Versailles in 1919. For this if for no other reason, the First World War centenary does not easily lend itself to celebration, past, present or future. 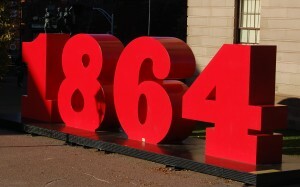 One could conceivably argue the same of the Charlottetown Conference sesquicentennial: most parts of the country have, at one time or another, viewed Confederation as at best a mixed blessing, and the union discussed in 1864 and formally enacted in 1867 has unfolded less as a grand romance and more as an arranged marriage between reluctant parties. Still, it seems easier to celebrate the present when we can contrast Canada’s relative economic prosperity, safety, and abundance with the situation elsewhere in the world, and at various points in its own past. With the exception of Confederation itself, it does not seem to be in the nature of Canadians to plan a bold future (unless they are thinking in separatist terms), but even bold futures seem more feasible in 2014 when imagined on a local or national scale, as compared to the world stage. 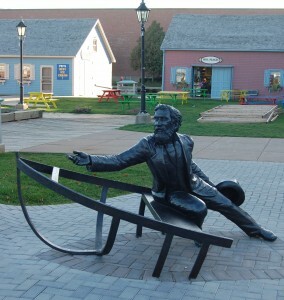 The hope and optimism inherent in the 1864 Charlottetown Conference make for a highly useable past on PEI in 2014 – good for local tourism, good for the local arts community, good for national morale. The First World War centenary, on the other hand… not so much. Even a somewhat sombre celebration of the First World War as a key step on Canada’s road to mature nationhood can seem inappropriate in light of elements of Canada’s war experience such as the bitterly divisive 1917 federal election and Quebec’s enduring sense of betrayal over conscription. There is a certain retrospective irony in PEI’s 2014 commemorative showdown. As Simon Lloyd pointed out in his analysis of 1914 Guardian coverage, Islanders had planned a 50th anniversary Jubilee celebration of Confederation in 1914, but the celebrations were postponed – and ultimately never took place – because of anxiety over the global situation. War trumped Confederation on Prince Edward Island in 1914, but in 2014 Confederation has finally had its day. Dr. Sarah Glassford teaches Canadian history at the University of Prince Edward Island, and has been interested in the politics of commemoration since her days as a graduate student. With Amy Shaw she co-edited the collection A Sisterhood of Suffering and Service: Women and Girls of Canada and Newfoundland during the First World War (UBC Press, 2012). [i] The Confederation Players were created for the 125th anniversary celebrations of the Charlottetown Conference, in 1989. 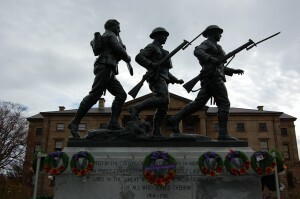 [ii] Visitors to Charlottetown can visually take in both narratives of nation-building at once: the provincial war memorial sits directly in front of Province House, where the Charlottetown Conference took place. Great post, Sarah! This is a superb series and an excellent contribution for Remembrance Day.